This set came out during the summer of 2014 which is the time when MAC let's us vote on which products we would like to see returned as a LE (limited edition) item. I've had this for quite awhile but didn't dare use it without photographing it first. It's a beautiful combination that I feel compliments any complexion and skin tone. The MAC Pink Poodle Lipstick has a glaze finish which is sort of like a frost but not as shiny. It glides on very smooth and stays put unless you eat or drink to make it disappear. In my opinion there's no need to wear this as a lipstick/lipgloss combination because of the glaze finish. MAC Pink Poodle Lipglass is very moist and sheer. I've worn it over a darker lipstick which brought out the shimmer particles contained within the gloss. 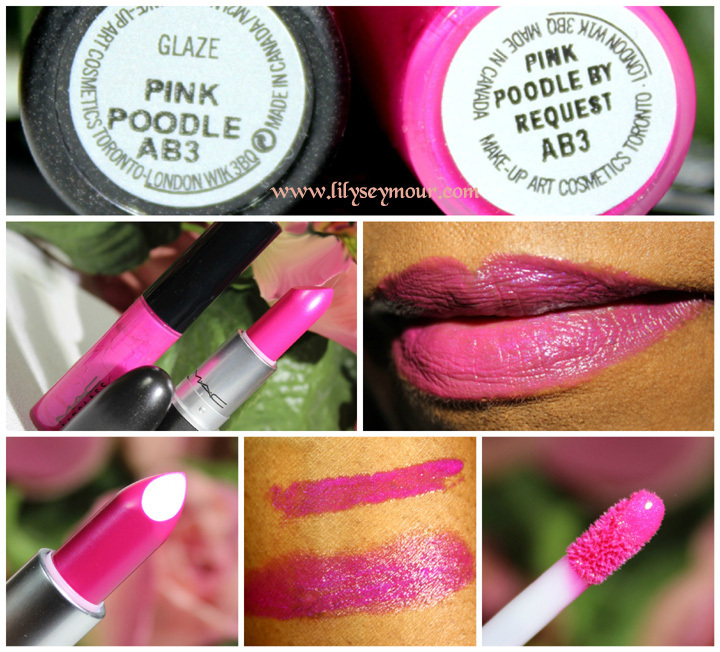 This MAC Pink Poodle Lipglass is very sheer worn by itself as shown below in the photo. The swatches below were taken with a flash, in my opinion they are very true to color as if the swatches were taken in outdoor sunlight.